The Finance Minister has been meeting with lenders. FINANCE MINISTER MICHAEL NOONAN will try to talk banks into cutting their high variable mortgage rates before the government steps in to take any direct action. Officials from AIB and Ulster Bank were due to meet with the minister today as pressure mounts on both the government and the banks to cut their standard variable charges in line with record-low ECB rates. The taxpayer-owned AIB has already cut its rates twice in the past six months, but both Ulster Bank and the Bank of Ireland have shown little appetite to sacrifice any of their income from borrowers. 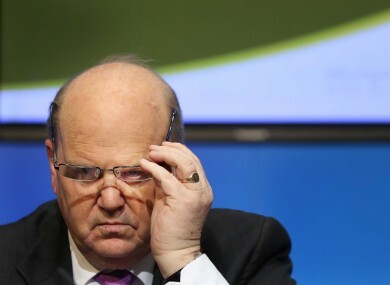 The Irish Times reported Noonan would tell heads of the six main banks that the government would step in to reduce mortgage rates if the lender’s didn’t take action. But last week he told the Dáil neither he nor the Central Bank had any statutory role in regulating interest rates and competition would be the crucial factor in ensuring rates fell. “The mortgage interest rates that financial institutions operating in Ireland charge to customers are determined as a result of a commercial decision by the institutions concerned,” he said at the time. Meanwhile the Central Bank has presented the government with research on the issue, but governor Patrick Honohan has poured cold water on the idea of directly intervening to force rates lower for the 300,000 variable mortgage customers across the country. The latest figures showed the average standard variable rate on all new variable-rate loan agreements was 3.3% in Ireland, compared to 2.3% across the eurozone. When restructured deals were stripped out of the figures, the average rate on new loans for people’s main homes rose to 4.2% and 5.22% for buy-to-let properties. Independent Senator Feargal Quinn yesterday published a private member’s bill that would give the Central Bank the power to order banks to cut their variable rates. The measure would last three years and only apply to loans taken out on people’s main homes. The government hasn’t responded to the proposal. Fianna Fáil finance spokesman Michael McGrath said the Oireachtas should pass laws to “address the scourge of excessive variable rates” if banks failed to act – although he didn’t believe a special levy was the way to go. After emerging from today’s meeting, AIB’s head of retail and business banking, Bernard Byrne, told reporters the bank saw “the trajectory of rates as downward at the moment”. We agree that rates can go down and we have a really active campaign at the moment, just starting, to really communicate that to customers,” he said. Email “Will this man finally get tough with banks if they don't drop mortgage rates?”. Feedback on “Will this man finally get tough with banks if they don't drop mortgage rates?”.